← Will Fed Chair Powell Respond to Trump’s Jabs in His Jackson Hole Speech? Prepare yourself. Buy physical silver and storable food. “After much deliberation and mathematical calculation, we have figured that it is absolutely possible for us to blow this smoke away with high powered fans,” the Facebook event description reads. According to KREM2, a CBS affiliate, the Inland Northwest has been socked-in with wildfire smoke for about a week and frustration is growing. 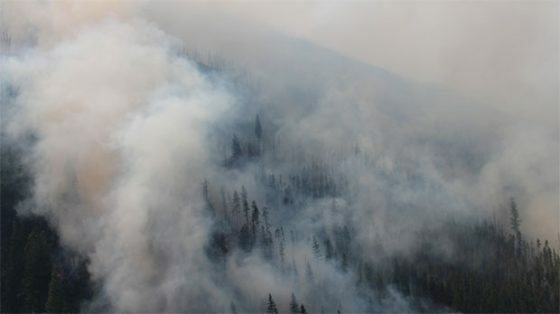 Canada’s British Columbia experiencing the third-worst fire season in recorded history, and all of the smoke from those fires spreading across much of the continent and even further diminishing air quality. Air quality across the region did improve Monday night to “unhealthy for some groups,” according to the Spokane Regional Clean Air Agency, but a portion of the smoke blew into the Inland Northwest from Canadian fires burning just above the border. So now, out of apparent frustration, Caleb Moon and his friends created the event on Facebook and are suggesting using box fans to blow the smoke back to Canada – where it came from. And the idea came to him when he turned on his own box fan. “So we turned the box fan on and it just kind of hit me there thought why not have everyone in Spokane turn their fans on and see if the smoke can get out of here,” Moon said. On Friday, Moon and his friends are asking people to gather their fans, climb to their rooftops, crank up the speed and point their fans toward Canada. “That’s where the smoke came from so why not send it right back,” Moon said. Although this event sounds more like a joke than anything, Moon says he’s seriously asking all Spokane residents to put five box fans on their rooftops and turn them on high to clear the air of the smoke. “We figure a small box fan can move smoke about six feet, so if you put 500,000 of them together, you can do the math on that, we can probably get it pretty far into Canada,” he said. British Columbia Center for Disease Control senior environmental health specialist Sarah Henderson told Global News that the idea was “very ridiculous,” noting that a fan does not magically clean air but “pulls air through it.” So even if it did work (which, again, it would not) the fans would probably just pull in more fresh smoke from the California wildfires. This article was posted in blow smoke to Canada, box fans, british columbia, Caleb Moon, Canada, Facebook event, fires, Headline News, Nic huber, Sarah Henderson, Smoke, social media, Spokane, Washington, wildfires. Bookmark the permalink. Follow comments with the RSS feed for this post.Comments are closed, but you can leave a trackback: Trackback URL.